Admiring the beauty and chillness of Nuwara Eliya – Sri Lanka's Little England could be anyone’s desire, but worried about finding Mosques in Nuwara Eliya? We have listed for you some amazing mosques at which the locals pray. Explore the magnificent city with our guide on where to pray in Nuwara Eliya! This is a prominent mosque with adequate prayer facilities in Nuwara Eliya. With separate arrangements for both men and women, making it handy for the travelers to drop in during the Salah times. The white exterior architecture of the mosque evokes a strong Islamic influences and is decorated with grey borders, and a gold dome, surrounded by small minarets. The prayer area of the mosque is spacious enough to hold a large number of worshippers and conveniently, the mosque also provides the ample parking lots for drivers. How to get there: 1.3 km or 17 minutes walking distance via Queen Elizabeth Dr and Bandaranaike Mawatha from Nuwara Eliya main bus-station. This is mostly visited by the Muslims in Nuwara Eliya living closer to those tea estates. This is because the mosque is located a bit further from the main town juncture and you will feel it is far if you are boarded in town. If you have planned a visit to the Tea View Resort, then this mosque is just a 6-minute walking distance. If you are stuck on the way to Nuwara Eliya from Avissawella during your journey and you hear the Azan, you can stop by Patana Mosque and perform your prayers. The mosque is designed in a simple style with brightly coloured doors and stained glass windows – the interior is spacious too. This mosque is located only 16.5 km from Talawakelle Tea Research Institute of Sri Lanka and can be reached within a 32-minute driving distance. 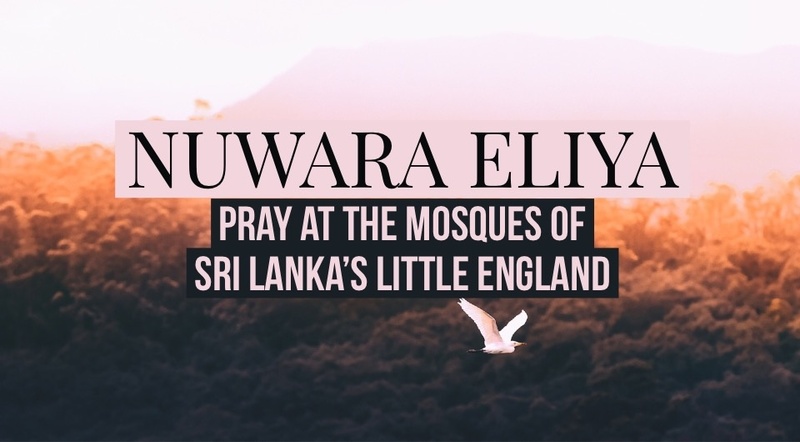 This mosque accommodates the prayer facilities in Nuwara Eliya especially for the Muslim village Kalapitiya that is located in Nuwara Eliya. The mosque itself is a white building with bright green glass windows that is beautiful when lit up at night. Although a little far from Nuwara Eliya, this beautiful village depicts the culture and customs of the Muslims in Nuwara Eliya. If you have time off from the city and would like to look around Nuwara Eliya, Kalapitiya could be one of those attractive places. The mosque stands out as a tall brown structure with four minarets and a large dome in the quiet setting of Dickoya. It’s quite simple to find, being located right along Dalhouse road right next to a few small shops, and you can enjoy the lush green scenery on the way. The mosque is a 12 minute driving distance from Ceylon Tea Trails – Summerville Bungalow.